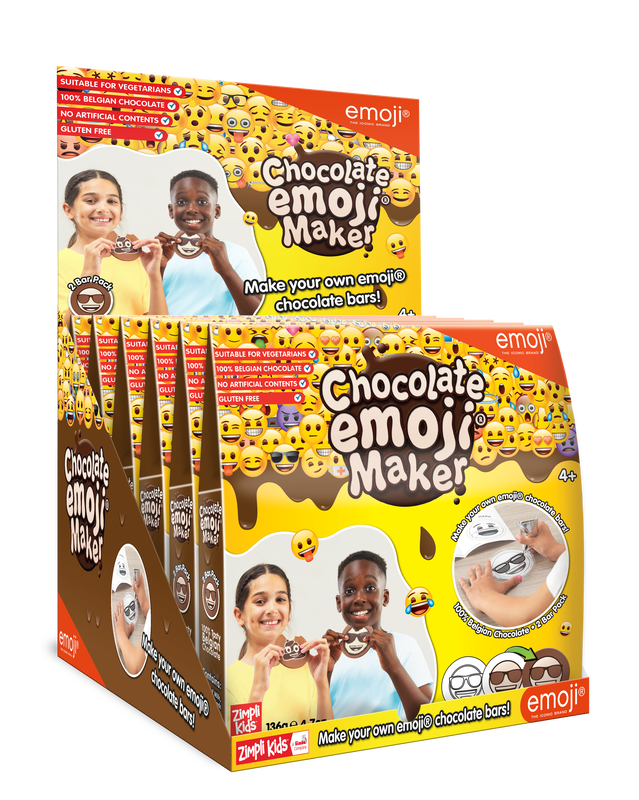 Chocolate emoji® Maker is our creative chocolate toy that lets you design and create your own chocolate emoji. ​Place the chocolate sachets in a bowl of warm tap water, wait for the chocolate to melt, and then get arty creating your favourite emoji! Snip the corner off your dark chocolate sachet, place an emoji stencil underneath the clear chocolate circle tray, and then draw your picture by following the outline of your stencil! Once you're done designing, drawing, and filling in the rest of your bar with the white and milk chocolate, put your bar in the fridge for 20 minutes and then enjoy! - Made with the finest Belgian chocolate. - No need for a microwave or boiling water. - Melt chocolate using nothing but warm tap water! - Draw your favourite Emoji! ©2015 - 2018 emoji company GmbH. All rights reserved. Licensed by Bravado. 2 x Tray Moulds, emoji®️ stencils and Instructions.